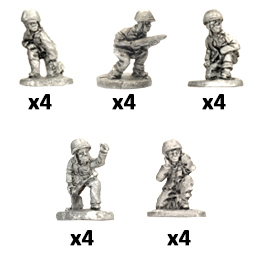 includes Command Rifle team, Staff team, Observer Rifle teams, four gun crews, Small three-hole base, Small two-hole base, Medium four-hole base, and base plug sprue. A staff team is an important component of large artillery platoons. The staff team’s job is to take the target’s map reference, radioed to them by the spotter, and convert it to angles and elevations for the artillery weapons. Their technical expertise allows the staff to perform complex calculations and communicate the results to the rest of the artillery platoon quickly. Left: The Marine Staff Team. 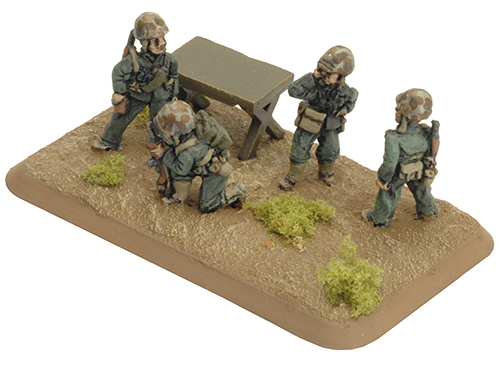 Check out the Marine Artillery Group in the online store here..
To do their job, a staff team needs lots of maps, plotting boards, charts and tables, not to mention radios and telephones. All this equipment prevents them from being very mobile or effective in combat. Although they are an Infantry team, Staff teams are part of their Artillery platoon and move slowly as if they were a Heavy Gun team. A Staff team can shoot as a Rifle team, but cannot function as a Staff team in the turn it does so. 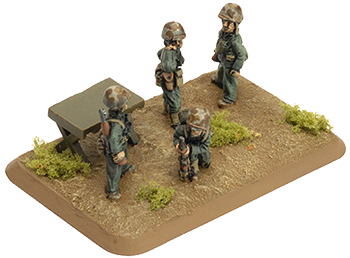 A Staff team can function just as well when it is mounted in its own Transport team as it can when Dismounted (as long as it is not Bailed Out or Bogged Down), but cannot function at all when mounted in another Transport team. If the spotter successfully ranged the artillery in last turn, the staff team can order all of their guns to repeat the bombardment on exactly the same place. The target coordinates for a repeat bombardment are exactly the same as the previous bombardment, meaning all weapons can fire again quickly and effectively. An Artillery platoon with a Staff team may Repeat an Artillery Bombardment fired in the previous turn. Because a Repeated Bombardment Ranged In on a previous turn, it automatically Ranges In on the first attempt this turn. The Repeated Bombardment must use the same Spotting team as the original Artillery Bombardment, and it must still meet the other requirements for a Spotting team (see page 126 of the main rule book). All Artillery teams that fired the original Bombardment and are still able to fire, must fire in the Repeated Bombardment, and no other teams may be added to the Bombardment. The Repeated Bombardment must use the same Template (see page 130 of the main rule book) as the previous turn’s Bombardment, unless there are insufficient weapons still firing. The Repeated Bombardment is centred on the original Aiming Point, regardless of whether or not the enemy team that was originally targeted is still there or not. a. 1x Officer speaking on radio. b. 1x NCO with Thompson SMG. d. 1x Kneeling radio operator. e. 1x Kneeling radio perator. f. 1x Prone observer with binoculars. g. 3x Standing officer. h. 4x Gun crewman gesturing with right hand. i. 4x Gun crewman with hands over ears. j. 4x Kneeling gun crewman. 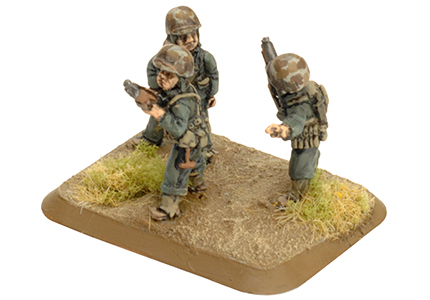 k. 4x Kneeling gun crewman. l. 4x Loader holding shell. 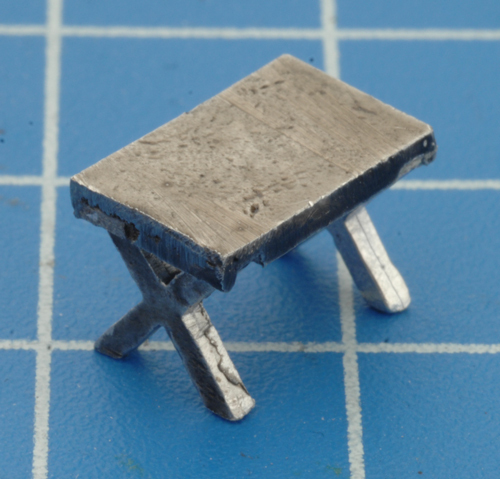 m. 1x Staff table trestles sprue. n. 1x Staff table top. a. 2x Standing figures with hand up. b. 2x Standing figures holding map. 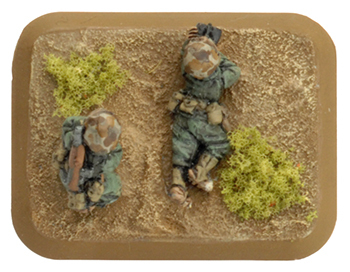 h. 2x Prone figure carrying radio. i. 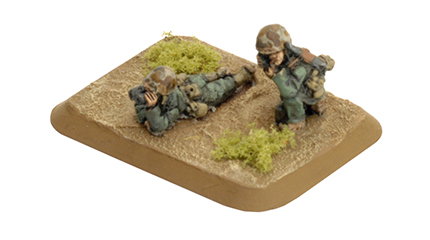 2x Prone figures talking on radio. 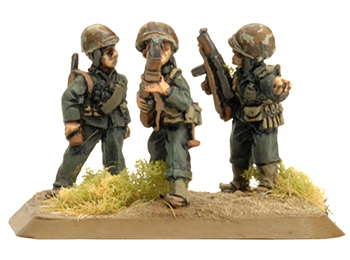 Arrange one of the standing officers (g.), NCO with Thompson gun (b.) 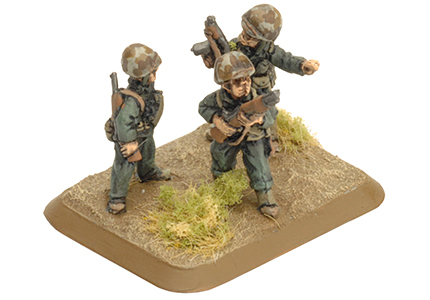 and standing rifleman (c.) on the provided small three-hole base. 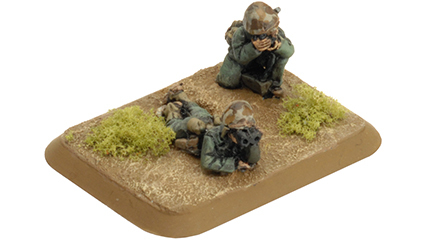 Arrange one of the kneeling radio operators (e.) and the prone observer with binoculars (f.) on the small two-hole base, using a base plug to fill the unused hole. Place the officer speaking on radio (a. ), the other kneeling radio operator (d.), two standing officers (g.) on the medium four-hole base, with the staff team table. Step 1. 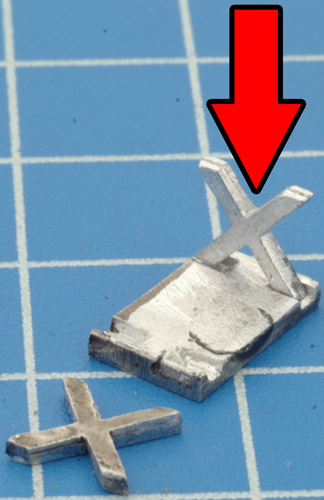 Attach the table legs to the underside of the table top. Step 2. Once both sets of legs are attached, the table is now fully assembled.